Lackawanna College provides access to information on the dangers and legal consequences of illicit drug and alcohol use. Lackawanna College is committed to the implementation of a program that is designed to prevent the unlawful possession, use or distribution of illicit drugs and alcohol by its students and employees on its premises and as part of any of its activities. In support of this commitment and in compliance with the Drug-Free Schools and Communities Act of 1989 and the Drug-Free Workplace Act of 1988, the information provided herein is designed to ensure that community members are aware of Lackawanna College’s drug and alcohol policies and applicable laws, the health risks associated with illicit drug and alcohol use, and the resources available to the college community. Lackawanna College provides services and resources for students who are directly and indirectly affected by the use and abuse of alcohol and other drugs. In the state of Pennsylvania it is legal for you to consume alcohol if you are 21 years of age or older. Please note however that in accordance with Lackawanna College's Alcohol Policy, no student, regardless of age, is permitted to consume and/or possess alcoholic beverages on the College premises or at College sponsored events. If you are of age to drink and are in a situation where alcohol is permitted it is important that you know the damaging effects that alcohol can have on your health so that you can make an informed decision to drink. Alcohol, or ethyl alcohol (ethanol), refers to the intoxicating ingredient found in wine, beer and hard liquor. 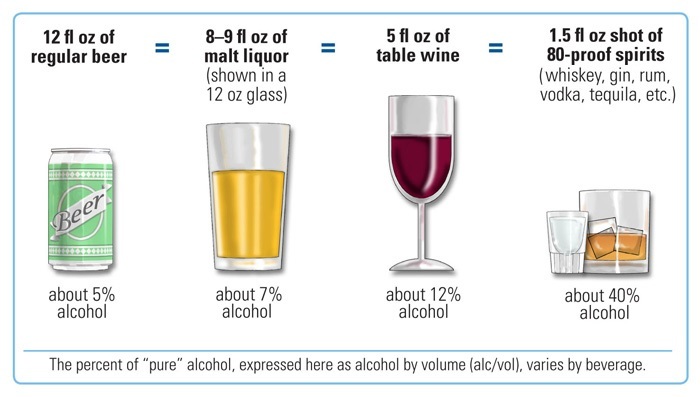 Beer, wine and other liquor contain different amounts of alcohol. The amount of alcohol in distilled liquor is known as proof. Proof refers to the amount of alcohol in the liquor; for example, 100 proof liquor contains 50% alcohol, 40 proof liquor contains 20% alcohol, and so on. Traditional wine has approximately 8-14% alcohol, while regular beer has 4-6% alcohol. Moderate or “low-risk” drinking: Research shows that people who drink moderately may be less likely to experience an alcohol use disorder. First of all click here to review what constitutes a standard drink? To stay at low risk for an Alcohol Use Disorder, you must keep within both the single-day and weekly limits. Even within these limits, you can have problems if you drink too quickly or have other health issues. According to the Center for Disease Control (2012), " Binge Drinking " is the most common pattern of excessive alcohol use in the United States. The National Institute on Alcohol Abuse and Alcoholism defines binge drinking as a pattern of drinking that brings a person’s blood alcohol concentration (BAC) to 0.08 grams percent or above. This typically happens when men consume 5 or more drinks, and when women consume 4 or more drinks, in about 2 hours." What does 1 Drink really mean? 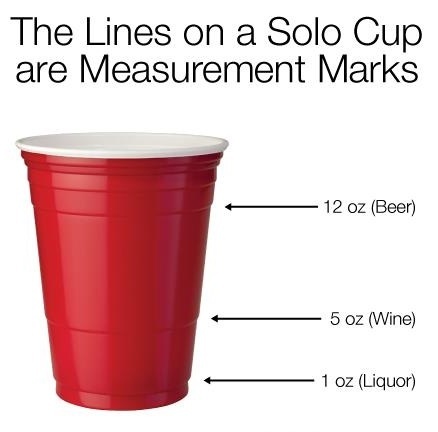 Fill this infamous Red Cup with an alcoholic drink and it is more than one standard drink. Think before you grab that drink! FACT: Using marijuana has been associated with memory loss, anxiety, and trouble concentrating. College students report that marijuana use is often related to missing class, being late for class, and a decrease in academic achievement. FACT: Recent research suggests that marijuana use can lead to a physical dependence, which may result in a person experiencing withdrawal symptoms (e.g. anxiety, sleep disturbances, and irritability) when they don't use the drug for a period of time. Further, a person may develop a social dependence on using marijuana, and continue to use it despite negative reactions. FACT: Marijuana affects alertness, concentration, perception, coordination, and reaction time, which are all essential skills for safe driving. FACT: Marijuana is still a Schedule I narcotic, as such it is illegal with no federally recognized medical uses. Possession of marijuana is a punishable offense. FACT: Smoking marijuana is linked to respiratory difficulties just as smoking tobacco is. Reports have stated that smoking 1marijuana joint is equal to smoking 16 tobacco cigarettes. 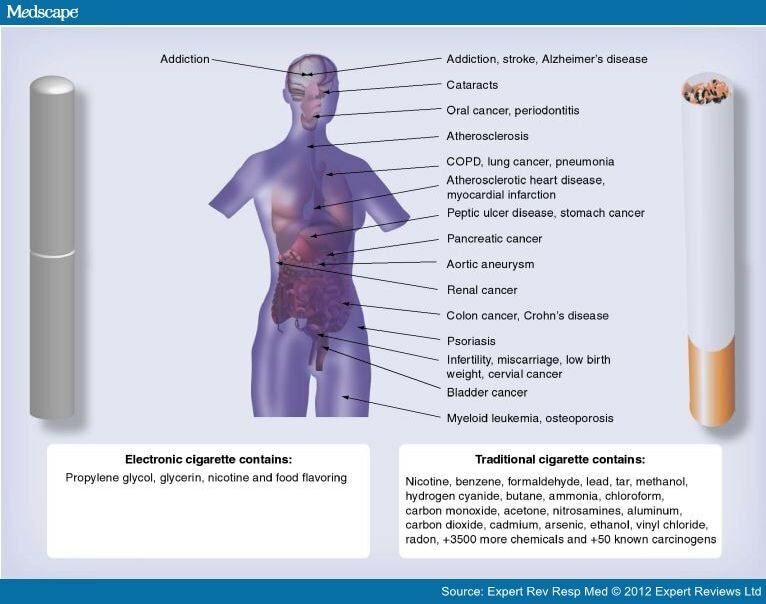 Marijuana smoke contains roughly 50-70% more cancer-causing chemicals than the levels found in tobacco smoke. 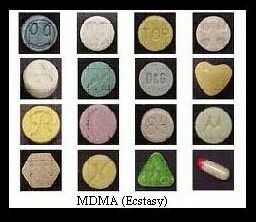 MDMA (3,4-methylenedioxy-methamphetimine), which is more commonly known as Ecstasy , and more recently Molly. It is a dangerous psychoactive drug that acts as a stimulant and a hallucinogen, as such it can cause increased heart rate, high blood pressure, clenched teeth, muscle tension, blurred vision, faintness, and chills/sweating. In high doses, MDMA interferes with the body's ability to regulate temperature, which may result in a sharp increase in body temperature, which can result in liver, kidney, or cardiovascular failure or even death. Often times MDMA, in its powder form, is mixed with other drugs, such as: ketamine, dextromethorphan (cough suppressant), ephedrine (stimulant), caffeine, cocaine, methamphetamine, and synthetic cathinones (Bath Salts). While these substances alone can be dangerous and harmful to one's health, when combined with MDMA the danger and risks increase. 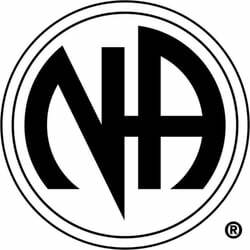 MDMA works by increasing the activity of 3 neurotransmitters: serotonin, dopamine, and norepinephrine. Serotonin plays a a role in regulating mood, thus an individual on MDMA may experience euphoric mood for a period of time. However, the surge of serotonin eventually depletes the brain of this important neurotransmitter, which may result in confusion, depression, drug-craving, anxiety, and sleep disturbances. Often prescribed for ADHD ( Attention Deficit Hyperactivity Disorder) symptoms in children, teens and adults. Most common: Ritalin, Adderall, Dexedrine, etc. Heroin is an illegal drug, an opioid drug that's processed from morphine which occurs naturally in the seedpod of the Asian opium poppy plant. Out of all opiates, heroin is the most widely used and fastest acting opiate there is. Heroin is usually found in powder form and is either white or brown in color. Heroin usually appears as a white or brown powder or as a black sticky substance, known as “black tar heroin.” Heroin is extremely addictive and depending on the intensity of use, a person can become dependent very fast, and develop a Heroin addiction often requiring medical detoxification. In 2011, 4.2 million Americans aged 12 or older (or 1.6 percent) had used heroin at least once in their lives. It is estimated that about 23 percent of individuals who use heroin become dependent on it. When Heroin enters the brain, it is converted back into morphine, which binds to molecules on cells known as opioid receptors. These receptors are located in many areas of the brain (and in the body), especially those involved in the perception of pain and in reward. Opioid receptors are also located in the brain stem, which controls automatic processes critical for life, such as blood pressure, arousal, and respiration. Heroin overdoses frequently involve a suppression of breathing, which can be fatal.